When Steve and I were living in Dubai, we came up with an idea of starting a journal to keep track of what recipes and restaurants we tried and liked. If we started when we thought of it, we would probably have a dictionary thick book or two already. Oh well, better late than never. My Pinterest addiction is good and bad. I get to find great recipes and ideas but in return, I get a sore arm. (Bad posture on the couch with the phone is really not a good idea.) Usually this happens when the 'tot' naps. So when he wakes up from his nap, we get on with the recipe of the day. I guess I am lucky that my tot eats anything I put on his plate. It encourages me to cook and bake with him. This is his chubby little hand going at his target. I promised him two of them but he managed to score four in the end. Well..That's why I like to go with a little healthier version of desserts! Its texture is a little denser than regular donut but it was nice and moist. I have tried many different baked donut recipes in hopes of finding a decent one that doesn't taste way too healthy(you know what I mean). This is one of the best baked donut recipes I've tried. 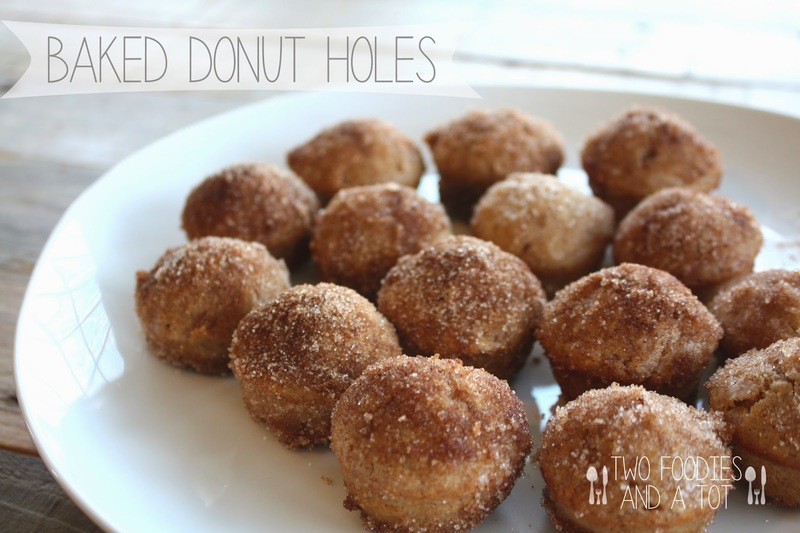 If you want to indulge the donut holes with a little less guilt, here is the recipe I got from Avery cooks. I just changed up the amount of coating to cover the whole donut holes. 1. preheat the oven to 350F. 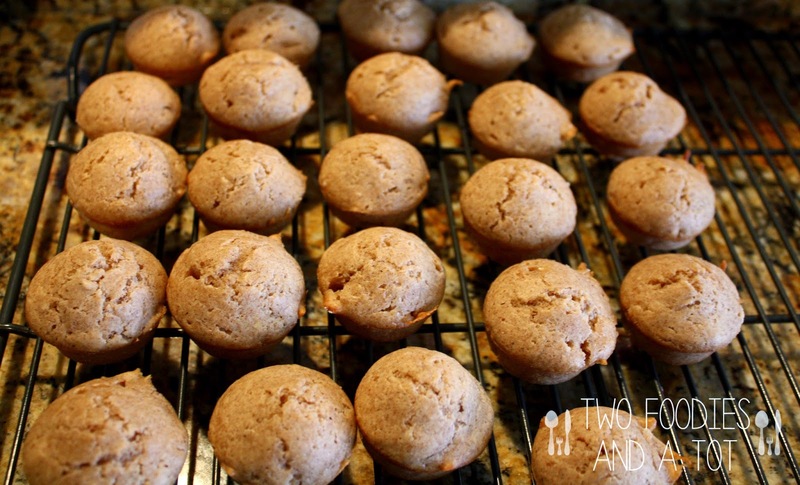 Grease and flour 24 count mini muffin pan. 2. Combine egg, butter, sugars, vanilla, and cream them until light and fluffy. 3. Scrape down the sides and beat in buttermilk until incorporated. 4. Add remaining dry ingredients and mix. Do not overmix. 5. Spoon the batter in the pan up to about 3/4 full. It made exactly 24 for me. 6. Bake for 9-11 minutes. Cool in the pan before removing the donuts. 7. While cooling, prepare the coating. Mix the sugar and cinnamon and melt the butter. 8. Dunk the donut holes in butter and coat with sugar-cinnamon mixture and enjoy! *They were still very good within a few hours and kept OK in airtight container the next day but coating tends to get a little soggy the next day.